To be honest, I was rather underwhelmed by this one. It's OK, nothing special. I tried this a couple of days ago. Well worth buying and good value in my opinion. One of the nicest gins I have had. My favourite gin for sure no contest! Smooth and delicate, with really beautiful nuances from all the botanicals, it just seems to make most other gins seem so harsh and rough in comparison. About the only one apart from sloe gins that you would drink neat. I do like Plymouth gin but this is the only exquisite one. How fortunate am I that one of my daughters lives on Shetland and the other visits to work on archaeological sites regularly, otherwise I may never have found this drink. I would not say I am am a drinks connoseur but I know what I like and Blackwoods is the best gin I have ever tried. Superbly smooth, makes magnificent G & T. I would recommend this to anyone - I do not believe it can be bettered. Intense aromatics and botanicals. Good neat. Makes a good gin & tonic. Doesn't work as a pink gin. 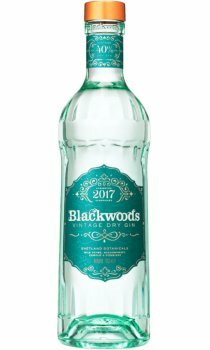 A bottle of Blackwoods Dry Gin was given to me as a birthday present.Having once tried it ,I should not have told my friends about it because they then descended and tried itand finished the bottle. Some friends!All were agreed that it is a beautifully clean taste with a length not usually found in other marketed gins. I think that the packet of wild flower seeds is a particularly sensitive touch. We have planted the seeds in our wild flower meadow and look forward to seeing them in the late Spring, but we will have consumed another bottle or so by then!